ARK in Berea - Green architects are now moving into designing living green walls -- think a vertical garden on the wall of a building -- as green roofs become more common stream. The ICEAlity incorporated in these walls help cool the buildings in the summer (reducing solar heat), insulate the building in the winter, water management (reduced storm water runoff for growth), and have the potential for helping feed the people (think vegetables, herbs....). The living wall offers a real benefit in rain water mitigation, offering the potential for reducing the burden on storm sewers and, down the line, pollution into water systems. And, the green vegetation provide a cooling effect in summer. And, part of the ARK in Berea’s overall environmental impact on climate change -- the 25 year old “living wall” increase greenery while improving the air. There are two main categories of green walls: green façades and living walls. Green façades are made up of climbing plants either growing directly on a wall or, more recently, specially designed supporting structures. The plant shoot system grows up the side of the building while being rooted to the ground. In a living wall the modular panels are often comprised of polypropylene plastic containers, geotextiles, irrigation systems, a growing medium and vegetation. As shown in reports from the US Network for EXPO2000, a project of the International Center for Environmental Arts (ICEA), urban population growth is not a sustainable option. Arne Dunker, manager of the Klimahaus in Bremerhaven states, "I remember having a discussion about whether it's a good idea to teach people that mankind is part of the global climate problem....this was way back in 2000 during the EXPO 2000 Worlds Fair in Hanover, Germany, this was a very controversial situation then, but today there’s no question that mankind contributes a lot to the climate problem." Green buildings are now an essential constituent of urban quality of life. It is noteworthy, however, that some cities have been more successful in implementing a green building policy than others. One concideration is geography, the insulating implications of five or six inches of soil might not be critical in modern super insulated buildings, but most buildings in temperate climates, are unlikely to have R-40 or so in the walls. Thus, an additional factor is the interesting question of back fitting opportunities in soome cities. Vertical walls could be relatively easy retro-fitted onto many buildings and many homes around the world. And they might offer the potential for significant energy savings along with fresh vegetables for the dinner table. Greener buildings are supposed to revolutionize the way the nation's built environment operates chiefly by using less energy. Seeing as U.S. commercial buildings account for about 30 percent of carbon emissions, according to the U.S. Green Building Council, improving the performance of the built environment is a key focus of all green building rating systems. But the green building industry has a dirty little secret: Until recently, few people really kept track of how so-called "high-performance buildings" were actually performing. The iconic Cleveland architecture of the ARK in Berea pre-dates the U.S. Green Building Council and its LEED certification program. The main driver for green buildings in the United States is the U.S. Green Building Council's Leadership in Energy and Environmental Design (USGBC-LEED) rating system. LEED-certified buildings, at the basic Certified level, are designed to use 30 percent less energy than buildings built to standard code. It would make sense to assume that LEED-certified buildings at all levels do in fact perform as advertised. "We're not seeing the true performance we might have expected [out of LEED-certified buildings]," says Jared Silliker, owner of Silliker + Partners, a green building-focused consulting firm based in Seattle. Unfortunately, in practice, incorporating commercial "green roofs" is used by businesses more as a public relations pitch aimed at the general population who don't know any better. "Green" roofs actually require an extraordinary amount of precautionary measures from water proofing to speciaized drainage to additional structural fortification to support the extra loads. By the time any savings from lower cooling costs are finally realized, it's time for some costly roof repair work - which, by the way, may well cost more that the average roof repair/replacement. All for the sake of "giving back" to the environment, or replacing the CO2 that the building's footprint took from the land it sits on. It's the way the world works today; auto, oil, banking, and every other industry, including the green industry, have been spinning their PR magic for years but as long as tax payers are not footing the bill there is no problem. Similarly, commercial "green walls”, though admirable for the heat gain reductions to the building envelope it will bring, may cost more than the very simple and zero maintenance solution of simply designing buildings with an "outer skin" that "floats" (is suspended) a foot or so away from the face of the building, providing a thermal break. Essentially a giant shade that air can flow behind so that no heat gain is realized by the actual building envelope. The ARK in BEREA living green wall is a residential example done in a cost effective manner that is a good solution for preventing houses from heating in summer and does not require substantial life-time maintenance costs, and a added incentive is that it is quite attractive. The plant primarily used in the ARK in Berea living wall is English Ivy and are about 25 years old. Characteristics of English Ivy Plants: Taxonomy classifies English ivy plants as Hedera helix. English ivy plants can act as groundcovers, spreading horizontally and reaching 8" in height. But they are also climbers, due to their aerial rootlets, which allow them to climb to heights of 80' or more. They will eventually bear insignificant greenish flowers but are grown primarily for their evergreen foliage. Their ability to grow in shade has made English ivy plants a traditional groundcover for problematic areas where most plants do not grow well. Their vigorous, dense grow habit makes them an effective groundcover where the object is to crowd out weeds. On slopes, they can be used for erosion control. The advantage of ivy vines climbing ability makes them excellent for ‘living walls’. In the Christmas carol, "The Holly and The Ivy," we see a symbolism with these two evergreen plants can be cut and used for natural Holiday decorations too. ICEA Cleveland Ingenuity: Green Walls Would Make Great Highway Sound Barriers. 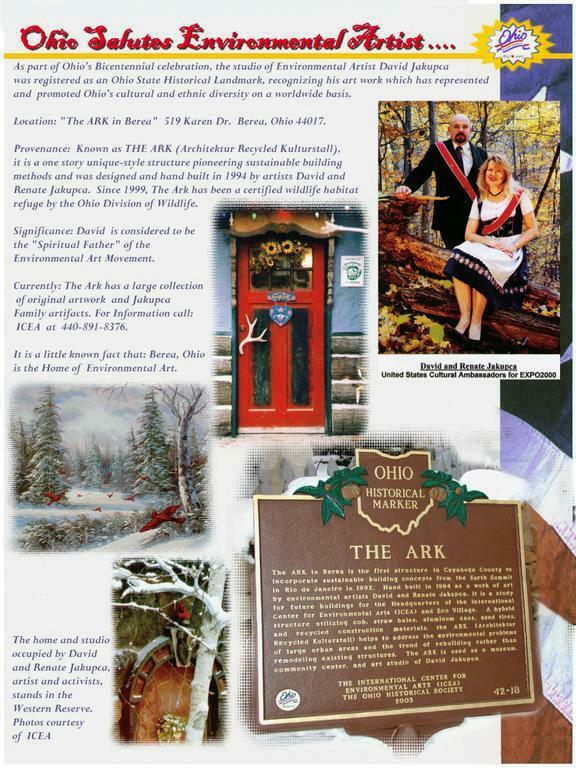 ARK in Berea - (ICEAnews) -American Cultural Ambassadors David and Renate Jakupca on Friday paid tribute to the victims of the Air France jet that crashed over the Atlantic. "We were deeply saddened to hear of the loss of Air France jst crash with 228 people on board," the Ambassadors wrote. "This accident ended the lives of hundreds of people, crew members and passengers and has led to immeasurable sorrow and loss to their loved ones. Sharing the sorrow and pain of the International Community, we wish strength of spirit to the relatives of the innocent victims. We would like to send our heartfelt sympathy to the families and friends of those who are involved. At this difficult time, all those affected by this tragedy are in our thoughts and prayers." they said. The passengers were of 32 different nationalities: 72 French, 59 Brazilians, 26 Germans, 10 Italians, and others from various countries. Among the crew members there were 12 victims: one was from Brazil and 11 were of French nationality. ARK in BEREA, May 18, 2009 - American Cultural Ambassadors David and Renate Jakupca stressed the importance of preserving and protecting the country’s heritage. They said history play a significant role for the social, economic and political development of a community as well as a country. The Ambassadors speaking at a symposium that opened here on Monday in connection with the International Museum Day marked here for under a theme “Museums for Tourism”. The Ambassadors said museums exhibit the tangible and intangible heritages of humanity thereby preserving and transferring history to the next generation as well us promoting them to tourists. Accordingly, they said the main aim of celebrating the day is to show the contribution of museums for the development of tourism and raise the awareness of the public on the issue. Manager of the ARK in Berea, the worlds first Eco-Museum, Edward Gottschick on his part said the museum has been executing activities aiming at the ongoing development activities of the community. Organizing visits to various historical places and symposiums aiming at raising the awareness of the society about ICEAlity and the community history are among the activities that have been carried out by the museum for the same purpose. International Museum Day has been celebrated all over the world since 1977. Each year, a theme is decided on by the ICEA's Advisory Committee. At the ARK in BEREA Eco-Museum everyday is a green EARTHDAY. At the famous ARK in BEREA, a Project of the International Center for Environmental Arts (ICEA), the first thing a visitor encounters is a frontal landscape covered in food plants: apple, nut, cherry trees, grapes, raspberries, strawberries with organic vegetables and flowers grown in season. 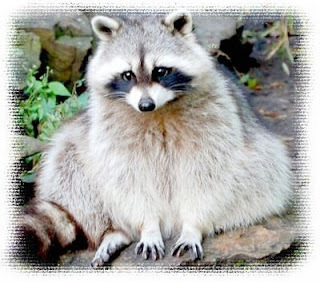 The grounds are an official wildlife habitat of both the Ohio Wildlife and National Wildlife Federations, not only providing food and shelter for all nature’s creatures, but setting an example of urban sustainability - adding Michele Obama in the White House as the newest convert! 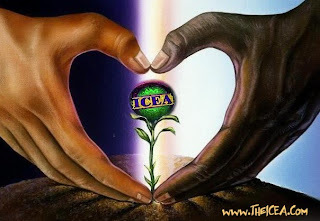 The International Center for Environmental Arts (ICEA) was founded in 1987 to meet the compelling needs of ordinary citizens for access to current, balanced, understandable information about complex global issues. On this Earth Day, confronting society are problems of mankind’s own making, solutions to which we, if we are to be responsible citizens of the Earth, must dedicate ourselves to. Humanity is daily destroying its rightful place in God’s universe with industrial pollution and violent acts against itself and its surroundings. Modern technology, more often than not, brings us closer to the assumed facts of these problems, promises to help us figure out solutions to them, yet creates a more complicated network of issues to confront than before. Since its inception in 1987, the International Center for Environmental Arts (ICEA) has played a pioneering role in finding solutions to issues of contemporary urban life that will enhance our human-made environment, manage our natural resources and create works of art to delight the eye and the mind. Our environmental artists are central to each level of human existence, from the basic provision of food and shelter to issues of community, manufacture and governance. 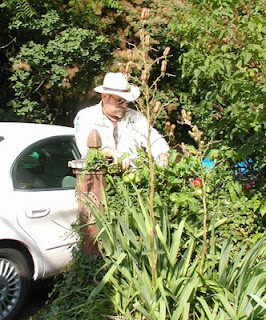 Berea, Ohio is the home of the global Environmental Arts Movement that is indigenous to North East Ohio. ICEAlity defines what it is to be humane in any natural endeavor. ICEA’s mission statement is: “The Theory of Iceality on Environmental Arts.…to assist an understanding between humans and their environment through ARTS and Culture, ultimately supporting a sustainable Culture of Peace for all Living Things“. This sums up what has been the right catalyst in the past decade for the interaction between technology and human expression to foster. ICEA’s responsible community programs and cultural projects will always be dictated by positive human values, and rooted in people’s sense of place on this Earth Day and the 364 days that follow. Works of ICEALITY are models for holistic solutions to problems, rich in values, casual relationships between the parts of the composition and the whole, concerns for the quality of the product of the complete life experience. "It’s possibly one of the most important things we (ICEA) can give to a child - teaching them the impact they have on the environment and the difference they can make just by themselves in the world," said Ambassador Renate Jakupca, co-founder of ICEA. The future into which young people today will be launched is already at hand in many respects. We know that it will be technology-driven for communications, visualization and information. We know that resources will be ever more scarce, and the options for using them constrained by the long-term effect of politics. Already the second generation of ICEA students are making use of the knowledge that they have acquired through our annual youth programs." The depth of character, both individually and as a community, is tested not by actions in good times, but by the quality of decisions in difficult times. The Arts will always stand shoulder-to-shoulder with each member and facet of society to face whatever challenges emerge. At the ARK in Berea, the global Home of the Environmental Arts Movement, we will be seeking opportunities to partner with the business community and social agencies, to sustain a high local quality of life for all. We will also work diligently to showcase our local community in attracting cultural tourism and new sustainable business development. Communities that pull together in hard times emerge as the future leaders in better times. The investment by ICEA sends a signal to the cultural sector – it is time to lead through these difficult days ahead. In uncertainty, let us all work together to build a community we will be proud to pass on to our children. In Berea, local organizations will show support for Earth Hour and encourage green habits with ICEAlity, from 8:00 p.m. to 9:30 p.m. at the ARK in BEREA, hosted by American Cultural Ambassadors David and Renate jakupca. When the lights go out, there will be outdoor activities to encourage movement, imagination and recycling fun! Around the World, lights went out at tourism landmarks and homes across the globe for Earth Hour 2009, a global event designed to highlight the threat from climate change. From the Sydney Opera House and Harbour Bridge to the Eiffel Tower in Paris and London's Houses of Parliament, lights were dimmed as part of a campaign to encourage people to cut energy use and curb greenhouse gas emissions from fossil fuels. Organisers said the action showed millions of people wanted governments to work out a strong new UN deal to fight global warming by the end of 2009, even though the global economic crisis has raised worries about the costs. "We have been dreaming of a new climate deal for a long time," Kim Carstensen, head of a global climate initiative at the conservation group WWF, said in a candle-lit bar in the German city of Bonn, which hosts UN climate talks between March 29 and April 8. "Now we're no longer so alone with our dream. We're sharing it with all these people switching off their lights," he said as delegates and activists sipped bluish cocktails. The UN Climate Panel says greenhouse gas emissions are warming the planet and will lead to more floods, droughts, heatwaves, rising sea levels and animal and plant extinctions. World emissions have risen by about 70 percent since the 1970s. China has recently overtaken the United States as the top emitter, ahead of the European Union, Russia and India. The UN Climate Panel says rich nations will have to cut their emissions to a level between 25 and 40 percent below 1990 levels by 2020 to avoid the worst effects of warming. Developing nations will also have to slow the rise of their emissions by 2020, it says. Australia first held Earth Hour in 2007 and it went global in 2008, attracting 50 million people, organisers say. WWF, which started the event, is hoping one billion people from nearly 90 countries will take part. "The primary reason we do it is because we want people to think, even if it is for an hour, what they can do to lower their carbon footprint, and ideally take that beyond the hour," Earth Hour executive director Andy Ridley told reporters at Sydney's Bondi Beach. In Asia, lights at landmarks in China, Singapore, Thailand and the Philippines were dimmed as people celebrated with candle-lit picnics and concerts. Buildings in Singapore's business district went dark along with major landmarks such as the Singapore Flyer, a giant observation wheel. Other global landmarks that switched off their lights included the Petronas Towers in Kuala Lumpur, the Reserve Bank in Mumbai, the dome of St Peter's Basilica in Rome, Egypt's Great Pyramids and the Acropolis in Athens. To help save energy 24/7/365 check out GreenerSearchEngine.com ( http://www.greenersearchengine.com ) aka "Envirogle" a local-based eco-project. We BereaBuzz.com ( http://www.Bereabuzz.com ) hopes to see you there! 'REALITY CHILD CHECK' - Should we Limit the Earth's Population? ...a creatively humorous visual blog by a woman on a taboo subject everyone is thinking about. Renate Jakupca, Chairwoman of ICEA's Sustainable Development Committee, says limiting the worlds population must be at the head of any policies on global warming and human rights. She states political officers, 'green' organizers and religious leaders must now stop avoiding the issue of the environmental harm caused by an over expanding world population. ARK in Berea: Peace Friends, I am Renate Jakupca, when I was married 35 years ago, my husband David and I made a conscientious decision not to have children, in part, to be honest, because blah blah blah blah blah blah blah blah CHILD BIRTH EDUCATION blah blah blaaaah blah blah blah blah blah blah blah blah blah blah blah blah blah blah blah blah RELIGION blah blah blah MOTHERLY INSTINCTS blah blah blah blah blah blah blah blah blah blah blah blah blah blah blah blah TEACH YOUR CHILDREN blah blah blah blah blah blah blah blah blah blah blah blah blahblah TEACH YOUR CHILD WELL blah blah. Blah blah blah blah GLOBAL WARMING/BASIC HUMAN RIGHTS blah blah blah blah blah blah blah blah blah blah blah blah blah blah blah blah blah MONEY blah blah blah blah blah blah blah blah blah blah blah blah blah blah blah lah blah blah blahblah blah blah blah blah blah blah blah PEACE blah blah blah blah blah SMILING HAPPY PEOPLE blah blah blah blah blah blah blah blah blah blah blah blah blahah blah. Blah blah blah blah blah blah blah blah blah blah blah blah blah blah blah blah OCTOMOM NADYA SULEMAN blah lah blah DR PHIL blah blah blah blah blah blah blah blah blah blah blah blah blah blah blah blah blah ANGELINA JOLIE blah. Blah blah ah blah blah blah blah blah blah blah blah blah blah blah blah blah OPRAH yadda yadda blah blah yadda yadda blah yadda yadda blah blah blah blah TYRA blah blah blah blah blah blah blah etc etc etc. Blah blah SHOCKING GLOBAL SCALE blah blah blah blah blah blah blah blah blah blah blah blah blah blah blah blah blah blah blah blah blah blah blah CHINA blah blah blah blah blah bl blah blah blah blah blah blah blah blah blah blah blah blah blah blah blah SLUMDOGS blah blah ah blah blah blah blah blah blah blah blah blah blah blah blah blah blah blah blah blah blah blah blah blah blah blahblah blah blah blah blah blah blah WERNER FORNOS, POPULATION INSTITUTE blah blah blah ah blah blah blah blah blah blah blah blah blah blah blah blah blah blah blah blah blah blah blah ah blah blah blah blah blah blah blah blah blah blahblah blah blah blah blah blah blah blah blah blah "ICEALITY" blah blah blah blah blah blaah blah blah blah blah blah blah blah. "TO SAVE HUMANITY = STOP HAVING EXTRA DISPOSABLE CHILDREN"
ARK in BEREA - IRAN slapped down US President Barack Obama’s plea for peace yesterday — as experts warned the rogue Gulf state could have a nuclear bomb this year. Obama offered a hand of friendship if Iran “unclenched its fist”. But Iranian president Mahmoud Ahmadinejad responded with a rant. He called for an apology for America’s “dark crimes”, and went on to demand troop withdrawals from Muslim lands and a block on US support for Israel. His response underlined the task facing Obama, who has pledged to make a “once-in-a-generation” bid for peace across the Middle East. American Cultural and Peace Ambassadors David and Renate Jakupca from the International center for Environmental Arts (ICEA) pointed out: "Shared concerns about ICEAlity and global Peace have sparked an international collaboration between generations of students at the Worlds Children Peace Monument (WCPM). The students from different hemispheres pooled their talents to create a peace pledge to draw attention to the need for peaceful reforms. During the WCPM project's, students from all countries collaborate on ideas through emails, a project blog and even later a "live" web conference. While language difficulties sometimes surfaced, good overall communications prevail and the project may yielded "many unexpected and pleasant surprises and an impressive range of approaches," said Renate Jakupca. The WCPM 2009 Peace Child Representative is a good candidate to meet with President Obama and reveal what has transpired in this joint effort of our future leaders and citizens. If President Obama and ICEA's Peace Child would present a gift of a WCPM Peace Stone from the US to Iran may help the boost the peace process. The International Institute for Strategic Studies estimated that Iran will have enough enriched uranium to make a single nuclear weapon this year. Iran is also developing long-range missiles capable of strikes as far as Israel and beyond. Meanwhile, Russia announced it had halted plans to deploy missiles near the Polish border. It could be a sign that Moscow is seeking better ties with the US, which has plans for a missile shield in eastern Europe. "The more the WCPM children can help us see different ways of looking at the peace problem the more our elected leaders can learn how to solve it." Renate said. The Jakupca's believes art and culture through ICEAlity can help broaden public awareness of important social issues. "The more children get involved, the more people will get involved," she said. "There is an accumlative affect." ARK in BEREA - "None of the amounts appropriated or otherwise made available may be used for any casino or other gambling establishments, aquarium, zoo, golf course, swimming pool, stadium, community park, museum , theater, art center and high beautification project." It was the president's economic stimulus package that passed Senate approval last week, 73-24, but local nonprofit arts groups and museum directors were none too happy. However, on Friday, Congress rewrote Section 1604 that now excludes the words "arts center," "theater" and "museum" in entities which will not be funded. The bill also includes $50 million funding for the National Endowment of the Arts. American Cultural Ambassadors David and Renate Jakupca of the International Center for Environmental Arts (ICEA) were understandably relieved at the updated bill. "This gives an insight into their thinking, I believe this is a political give-and-take situation where the lawmakers are using this to validate their 'essentials only' stance and does not necessarily mean that they would cut off all funding to the arts in the future. It is surely tunnel vision and does not recognize the value of the arts in the rehabilitation of the American way of life. Where did all those beautiful historic buildings that we work to preserve have their origins if not in government spending?" argued Ann Hansen and Jim Kern, executive directors for the Benicia Historical and Vallejo Naval and Historical Museum. Kern said he received an "emergency e-mail" last week from various museum associations. "There was a very brief window of opportunity for museums to contact their senators and urge them to oppose the amendment," Kern said. "Museum supports should be very please that we were able to mobilize a massive field-wide effort to prevent a funding ban," said Ford Bell, president of the American Association of Museums. "I have no idea yet how much money might be available to museums or what mechanism will be in place to get it out where it will do the most good," said Kern, believing it's a wise decision to assist museums. "Museums employ more than a quarter-million Americans, spend an estimated $14.5 billion annually, and rank among the top three family vacation destinations," Kern said. "The Vallejo museum alone brought almost 10,000 into downtown Vallejo last year." The nonprofit sector, Kern noted, "has a proven track record of providing quality services on a limited budget. We know how to get the most 'bang for the buck' when government funds are made available to help us. We also believe in accountability and can show, to the penny, where every last cent of this stimulus money would be spent. That's probably a lot more than can be said for some of the large financial institutions that received billions of dollars with little or no oversight." Stacey Loew, the Mira Theatre Guild's president and performer, couldn't understand why arts organizations wouldn't be financially bolstered. "Perhaps it is not thought important to some, but now, more than ever, diversions from the harsh realities of life are greatly needed," Loew said. "I have been witnessing lately far too many theater companies falling by the wayside." "At a time when people are jobless and the whole economy is hurting, they cannot realize that we are the very sources to which people look for their relaxation and entertainment," Hansen said. "I believe it is a time when we who are in a community role must step up to the plate and provide for the citizens' needs. We are not cutting back on activities. We are increasing them." Monica Tipton, a Mira board member, believes "the political effort to not have 'fluff' benefit from taxpayer dollars is a result of the Bush Administration and the NCLB (No Child Left Behind), "which have completely negated and devalued the arts in particular, especially in relationship to education." While she's hopeful the new bill provides some light at the end of the fiscal tunnel, "the grant process will be very competitive," Tipton said. The arts "are not a luxury, but a necessity that other civilized countries around the world support," said Tim Zumwalt, publicist for the Vallejo Symphony. During the Great Depression, "a lot of federal money went to the arts -- murals in San Francisco, writers, theater companies, et al" -- said Zumwalt, relaying that maestro David Ramadanoff "keeps saying that in bad times, people need the arts to heal and press on." Dyanne Vojvoda of the Benicia Old Town Theatre Group said it "is not surprising that the cultural scene is facing economic crisis, our communities are fearing losses of jobs, homes, and a sense of well-being. Though the arts can provide us with great pleasure in sad times, the news of no additional money spent on the arts is not shocking. Thank goodness that, as personal resources permit, thousands of people still find that attending live performances and art galleries are necessary and empowering." Harry Diavatis, veteran local actor and director, supports the first Economic Recovery Bill. "The term 'the arts' is so generalized as to almost be vague," he said. "It encompasses every aspect of not for profit groups from regional theater, opera, ballet, symphony orchestras, museums and other art organizations. In the theatre world, that range is as varied as the American Conservatory Theatre in San Francisco to Vallejo Music Theatre and the Mira Theatre Guild. Diavatis said, "is that during these hard economic times, all Americans including not for profit arts groups need to tighten their belt and find ways to cut costs while trying to attract more patrons. The Arts, in and of themselves, do not need glitzy palaces such as the Empress Theatre to survive. Not funding the arts will not mean their demise, it just means that they will go through a tough period of adjustment as most other American enterprises are currently suffering through." The bottom line the Jakupca's said, "is that in depressed area's like Cleveland, stimulus funding for projects using ICEALity causes Positive Cultural Balancing: The essence for “calming” and harmonising the natural energy. It deals with the energetic legacy of discord and strife that has occurred in the past, which has left an negeative energetic imprint. ICEAlity balances and releases this “battle energy”, bringing a positive sense of peace and harmony to the afflicted neighborhood. ARK in BEREA: The International Center for Environmental Arts (ICEA) enjoyed record-breaking critical success in 2008 as its ICEAlity projects become part of Ohioans every day life. The environmental arts and cultural sector combined with the tourism industry can take the lead in Berea's economic recovery, American Cultural Ambassador David Jakupca insisted. “With our great cultural heritage, new historic monuments, ability to project culture that's based on ICEAlity, sporting facilities and functions, willingness to be creative and innovative…we have this huge opportunity for the future,” enthused the Cultural Ambassador. 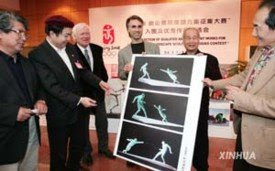 The WCPM Project is welcomed news:"Gov. Strickland's government’s recognition that culture when used with ICEAlity, is part of the answer to tough economic times is right and very reassuring,” conceded Cultural Ambassador Renate Jakupca. "Berea's WCPM Peace Stone Sculptures in cities across the state play a vital role in communities they are situated". These historic Peace Stones, their respective collections, and the valuable services they offer to our youth are key to the economic tourism sector but also play an important part of everyone’s daily lives. About WCPM: Designed at the ARK in Berea as a project of the International Center for Environmental Arts (ICEA) and built at Coe Lake Park in Berea, Ohio. the Worlds Children Peace Monument (WCPM), utilizing the principles of ICEAlity, will become the largest art work dedicated to a sustainable Culture of Peace as Peace Stones are added annually to cities around the World. The WCPM was officially inaugurated in 2003 at the 3rd World Peace Conference held in Verbania, Italy by American Cultural Ambassadors David and Renate Jakupca, where they received an Italian Medal of Arts.They were also recognized by the United Nations in Geneva, Switzerland and in 2006 appointed Universal Peace Ambassadors.The WCPM is organized in support of the UN Decade of Peace and Non-Violence for the Children of the World and the UN Millennium Development Goals. The Ohio State Department of Tourism under Governor Ted Strickland has listed the Worlds Children Peace Monument as an Official State of Ohio Attraction. "ICEALITY - assisting in the understanding of the relationship between Humans and their Environment through the Arts to promote a sustainable Culture of Peace"
A collaborative style is one of the most dramatic changes President Barack Obama has brought to Washington — and it is one that artists here and throughout the country can relate to. "That tone he sets of reaching out, of listening, of welcoming diverse ideas — it feels very familiar because artists are collaborators. You make music in an orchestra by being in tune with a lot of other people," said Marc J. Vogl, of the William and Flora Hewlett Foundation in Menlo Park and a member of the Obama Arts Policy Committee during the campaign. Still, there are good signs. 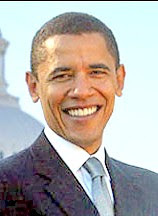 Obama, a best-selling author and admirer of poetry, J.S. Bach and Stevie Wonder, has expressed a desire to deepen the federal commitment to arts education and to create an Artist Corps patterned after the Peace Corps, sending artists into low-income schools and communities. Some even predict Obama could establish a Cabinet-level Secretary of the Arts, an idea advanced by Quincy Jones, who has posted an online petition. The needs are urgent, but there's a "fairly narrow window right now to capture this moment where the new administration in America is focused on public service and the importance of the arts," said Kiff Gallagher, a singer-songwriter and former Clinton administration officer who has established MusicianCorps, a service organization in the Bay Area to bring musicians into schools and after-school programs. In its $820 billion economic stimulus package, the House of Representatives included $50 million for the National Endowment for the Arts to funnel to arts groups to create and save jobs. The Senate over the weekend was hammering out its own version of the economic plan. Though $50 million is less than one-tenth of 1 percent of the House funding package, national arts leaders say what's significant is that they are being invited to the table — like banking and auto industry leaders — by an administration seeking a new path. As Lisa Mallette, executive artistic director of the scrappy little City Lights Theater Company in downtown San Jose, put it, "There's no way to go but up." Obama's decision to have an arts policy committee working for a year to develop recommendations during his campaign was unprecedented. Within days of his election, the administration appointed former NEA Chairman Bill Ivey to lead the arts and humanities transition team. Ivey recently convened a meeting of about 20 national arts groups — representing museums, dancers, chamber and orchestral musicians, Latino arts groups and more. He sees the arts as part of the nation's economic engine — able to deliver jobs, and quite a few. The 100,000 nonprofit arts groups in the United States directly support 1.3 million jobs, said Robert Lynch, president and chief executive officer of the national lobbying group Americans for the Arts. Those numbers may be too big to ignore, and arts groups hope they will translate into greater clout. Ivey believes the administration is "seriously considering" a new position in the West Wing for a senior official with an arts-and-culture portfolio in the President's Domestic Policy Council. That official could have the president's ear and begin to connect the dots between federal arts agencies and programs. Now, arts groups wait to see if Obama will adopt any of the recommendations made by the Obama Arts Policy Committee during the campaign, such as creating new tax incentives for nonprofit arts groups, and exercising the nation's "soft power" by sending artists around the world to reinvigorate cultural diplomacy. In 1997 David and Renate Jakupca from the International Center for Environmental Arts (ICEA) were appointed American Cultural Ambassadors to EXPO 2000, the Worlds Fair held in Hanover, Germany. The US Network for EXPO2000 will be celebrating its 10 years of innovation, ingenuity and iceality at the opening of the Expo 2010 held in Shanghai, China. ARK in BEREA: The Berea Chamber of Commerce have chosen a design by Cleveland artist Hector Vega for the cover of their GRINDSTONE Magazine. 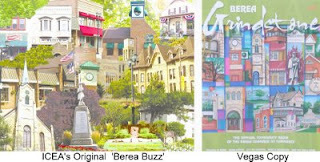 But acclaimed Berea Environmental Artists David Jakupca, used the same basic image called "BEREA BUZZ" in collaboration with fellow photgrapher Denise Andrews for the copyrighted cover photo of the BereaBuzz.com community website. Mr Jakupca said: "OK, you are required to do some research before you release a Magazine cover". The GRINDSTONE Cover is nearly an exact duplicate of Denise Andrews and my collaboration, which came out a couple of years ago. "Both covers feature a collage of Berea landmarks. The exception is the Vega's omits in his cover the famous Worlds Childrens Peace Monument (WCPM). "BEREA BUZZ" was created directly in conjunction with the WCPM and its connection to ICEAlity to the International Art Scene, so before people run off about how cool the new Vegas cover is, show them the complete yours/ours "BEREA BUZZ" art work from Berea first." "Naturally, when something we have slaved over and invested time and resourses (in Berea), fought for recognition over (in Berea), is so easily undone by jobbing out commercially, we feel a bit exploited. And if imitation is the highest form of flattery it is also the cheapest, but we are going to be the bigger man and just say we are proud as an American Cultural Ambassador to inspire other artists with My Original Work". This claim comes just days after the Associated Press has determined that a image used in the Obama 'Hope' poster that was used everywhere during last year's presidential campaign by Shepard Fairey , is actually an AP photo and that its use required permission. Related news is that the Irish band U2 was found copying the photo of their newly released No Line on the Horizon Album from Taylor Deupree, a musician from New York, who used the same image for his 2006 CD Specification Fifteen.